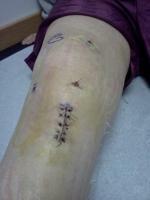 i had my right ACL reconstruction surgery three months ago with a patella cadaver after tearing my ACL playing soccer for my college. A couple of things i would recomend..ALWAYS ask your physical therapist what you can be doing to push yourself, because it might hurt or be tiring but i am almost done with rehab at only three months and can hopefully start playing soccer again soon. Also, i am not sure if this will end up hurting me or not but i pushed myself to do more than my physical therapist or my surgeon said i could do. I started jogging around 1 and a half months and constantly lifted weights before and shortly after surgery. It is so important to go into surgery strong so, even with a torn acl, you can lift weights and strengthen your muscles in your leg before surgery and this will help you sooo much after surgery. Another thing, not to scare any one who is about to get surgery but has anyone here thought the nerve blocks they give you before you are put to sleep are the worst pain of all?! I passed out after the first nerve block was put in because of how painful it was, thank goodness i wasnt awake for the nerve block put into my groin! Good luck to everyone and i honestly believe that though this recovery is hard it is not anywhere near as hard as some people make it out to be, as long as you keep healthy and strong it is just a learning experience.